Turnberry Resort has become the first in Scotland to launch iPad menus in its bars and restaurants as growing evidence suggests that the technology boosts sales and improves the customer experience. The increasing popularity for iPad menus in the USA was recently picked up in London by Gordon Ramsay’s Maze Restaurant. Scotland will experience the latest technique in ordering a round for the first time at Turnberry. 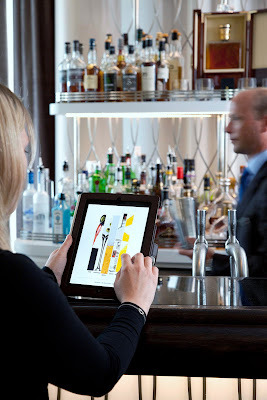 The Luxury Collection Resort has invested in ten iPads which will give guests a colourful and highly informed choice of wines, whiskies, beers and cocktails on offer in any of the resorts three bar areas. Ralph Porciani, Director of Operations at Turnberry, commented: “We’ve seen this in the States for a while and it absolutely improves and enriches the experience of choosing from a menu. The ability to combine images, with more colourful information on background to the product, be it the wine maker or the grapes, is incredibly satisfying for guests and gives them a far more informed choice than the traditional paper menu could offer. The news follows Turnberry’s recent launch of a range of famous golfer’s wines which will also feature on the new iPad menus. These include the personal selection from players such as John Daly, Retief Goosen and Arnold Palmer. Turnberry Luxury Collection Resort is a Founder Member of The Elite Ayrshire Business Circle.